Proceeds go to World Vision clean water wells in Africa - click to read more. 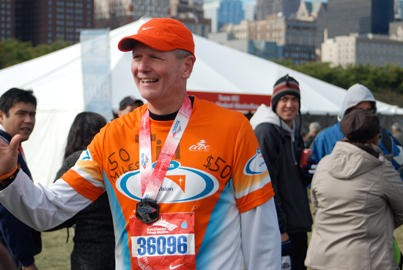 In the fall of 2009 as I was turning 50 years old, I was inspired to run 50 miles in a single day and to use the run as a platform to raise $50,000 for clean water wells in Africa and for the development of a walk/run club in the Austin neighborhood of Chicago. At 2 a.m. on October 11 I was joined by a small group of supportive friends to run 23.8 miles to the start of the Chicago marathon and then to run the 26.2 miles of the marathon itself. The run took 10 and a half hours. $58,000 was raised. And many lives have been changed. But this run was simply a symbol of a much greater challenge in my life – to offer my weakness and brokenness to God so that he would make me into a great story...a story that I would be able to tell about him and how he used my life to help change the world a bit more toward what it was created to be. 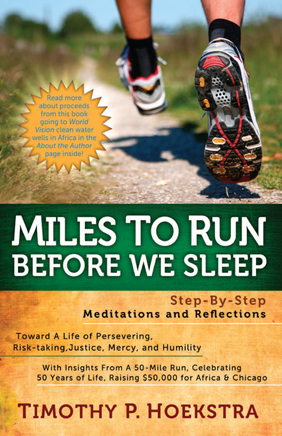 It is this story that is shared through a series of meditations and reflections in my book "Miles To Run Before We Sleep." I hope that it will serve as an invitation for you to consider your own version of offering your weakness to God and his world...so that you too participate in making it a better place. Indeed, we have miles to run before we sleep. Tim Hoekstra is the mentoring/teaching leader for Suburban Life Community Church, a church he planted more than twenty years ago. Tim and his church community work to learn about and live a life of racial reconciliation and diversity, and are devoted to partnering with under-resourced communities in Chicago. Along with his church work, he also served in past years as a college chaplain and as the associate director of church relations for World Vision Chicago, taking church pastors and leaders to several countries in Africa. He has also served as the coordinator of a running/walking/mentoring program for kids and adults in under-resourced communities on the west side of Chicago for the Steps Foundation. He is passionate about seeing churches, ministries, and leaders developed that are ethnically diverse, that honor and submit to those who are impoverished and marginalized, and that seek to unite people across lines of location, socioeconomic position, denomination, and giftedness. Tim has run seven straight Chicago marathons, and in 2009 in celebration of his fiftieth birthday he ran fifty miles, including the Chicago marathon, and raised fifty thousand dollars for clean water wells in Kenya. Tim and Laura, his wife of twenty-nine years, live as a bridge between suburbs and city near the west side of Chicago in River Forest, Illinois, and have three children, two of whom are married. They are expecting their first grandchild. Many donors came together to not only help get this book published, but also to help the advance purchase of three thousand books. Because of their generosity those books are able to be sold and I am able to donate all the money to World Vision clean water well projects in Africa. In our weakness, we have come together to change the world. Their efforts could result in more than twenty thousand dollars toward more clean water in Africa. I also want you to know that all the royalties that I receive from the sale of this book will be donated right back to World Vision and clean water projects. After all, this book is a result of God coming upon me in my weakness, and therefore it really is His story anyway. It is a story to be told and to be given away toward a greater story!